This blog is to honor the quiet legacy left to the iris world by Gerald Richardson. I hope he is barefoot and up to his waist in new seedlings on the other side. It is called paradise for a good reason!! Gerald Richardson was no ordinary guy! Fully invested in his work at the Atomic Energy facility in Richland for most of his working life, his eventual retirement there gave him more time for growing and hybridizing Tall Bearded irises. Short in height, this brilliant and talented man was a giant among mortals. He purposely remained busy and involved in his many studies and hobbies; he was an amazing wizard of investment, quietly turning his spare change into a sizable fortune. Richland is not a short drive from the Salem-Portland area. It was one of my highest honors and privileges to visit his matchless garden 5 times in the past 15 years. This quiet and unassuming gentleman always had a garden filled with bloom. He declared that he had no idea how or why virtually every named variety and seedling in his garden were filled with stalks! It was a corner lot that would slow traffic to a crawl. More often than not, this energetic human dynamo was covered and dressed for protection from the hot desert-like sun while his feet were bare and dusty!!!! On my final visit with my friend Gerald, Parkinson's had slowed his speech and movements to a crawl—yet his mental capacities were as incredible as ever. He apologized profusely for not having felt up to fertilizing his plants though yet again virtually every clump was filled with iris stalks. 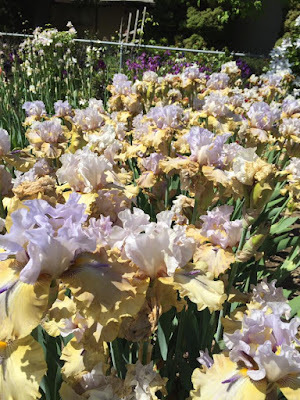 Barbara Nicodemus exclaimed after her visit there that she had never seen such massive percentage of bloom in her lifetime of growing and breeding irises! Gerald selected seedlings based on two primary factors: (1.) He had to really like it and (2) it had to show distinct improvement or be uniquely different from other irises in commerce. 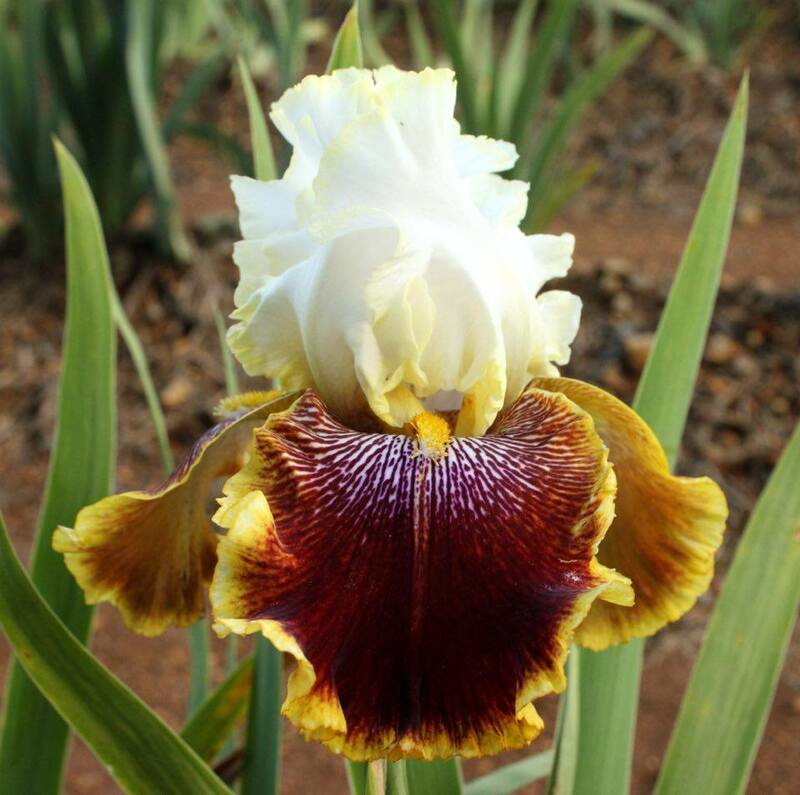 He was the first established hybridizer to quietly work with Allen Ensminger's “broken-color” patterns and he was an early fan of the Lloyd Austin “horned, spooned and flounced” irises. He said he was not breeding irises for profit (followed by a full body laugh!) and that he felt that “different” was necessary for expanding interest in the tall bearded iris classes. He taught great lessons by example. He believed that an iris was a garden plant and he grew impressive 2-3 year clumps in his garden to perfection! 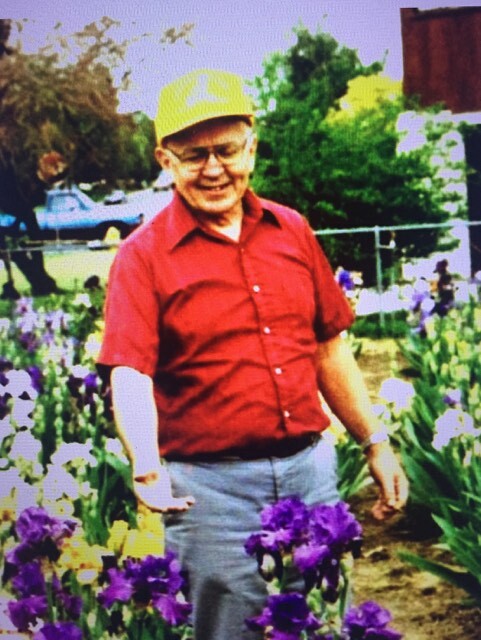 His last and final great gift to the iris world was financial in nature to the American Iris Society with a cash gift. He wished above all else that his gifts would be invested in innovative, hands-on, much needed research on bearded iris diseases—specifically soft rot, crown rot, and botrytis. And now a look at some my favorite Gerald Richardson introductions! all accomplished in this fine iris. 'Crimson Tiger' and 'Infernal Fire' were his two contributions to the variegated/broken color patterning randomly applied to the entire flower. Blue was clearly his favorite color. And why not? How many perennials with blue flowers are in your perennial garden? 'Blued Indigo', 'Donaghcloney', 'Dusky He-Man', 'He-Man Blues', Magheralin', 'Perrymount', and 'T-Rex' were among his darker and mid-toned selections. Each had large, clean, smoothly-colored flowers with excellent substance and plant habits. I would tease him about filling a void for magnificent blue varieties when Schreiner's Gardens expanded to many additional color schemes in their breeding program. 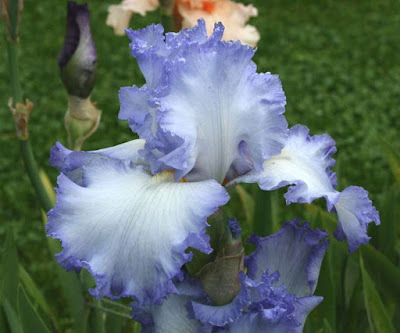 'Surfer's Dream' was his supreme addition to the softer blue color class of garden irises! I remember seeing this as a seedling in his garden for the first time on the day of its maiden bloom. Gerald was glowing and standing tall just waiting for me to point and gasp at this magnificent iris! 'Bev' is named for his iris friend Bev Petrak. (She and one other iris person attended his memorial service.) 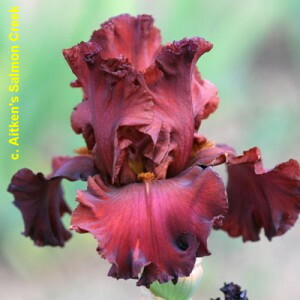 The red color in this iris is smooth and strong with chestnut undertones. 'Bev's Babe' followed a few years later and is still likely the strongest approach to “true” red in the garden. I never quite understood why one of the better known hybridizers didn't work with this amazing color gem. Both had unusually good form for the red color class. 'Blockbuster' had huge flowers and huge plants in a soft blue-lavender color combination with infusions of gray and yellow. It was also tall and the stalks remained upright on established clumps. 'Blueberry Fudge' was a deep, rich “electric” violet like no other. 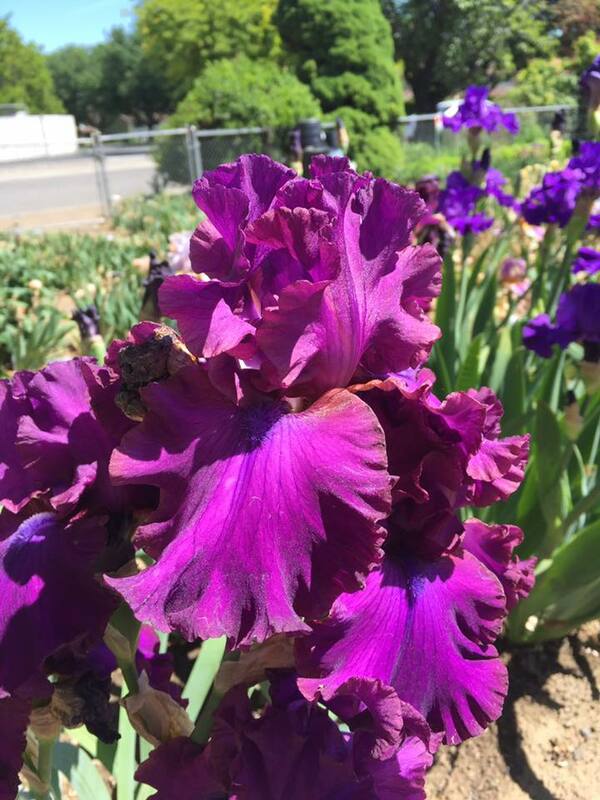 Its bronze beards and blue flushes make it one of the most uniquely colored irises ever to appear in American gardens. 'Lucille Richardson' was a blend of gray, lavender and orchid; its wonderful color and flower form can likely be credited to Larry Gaulter's 'Mary Frances'. 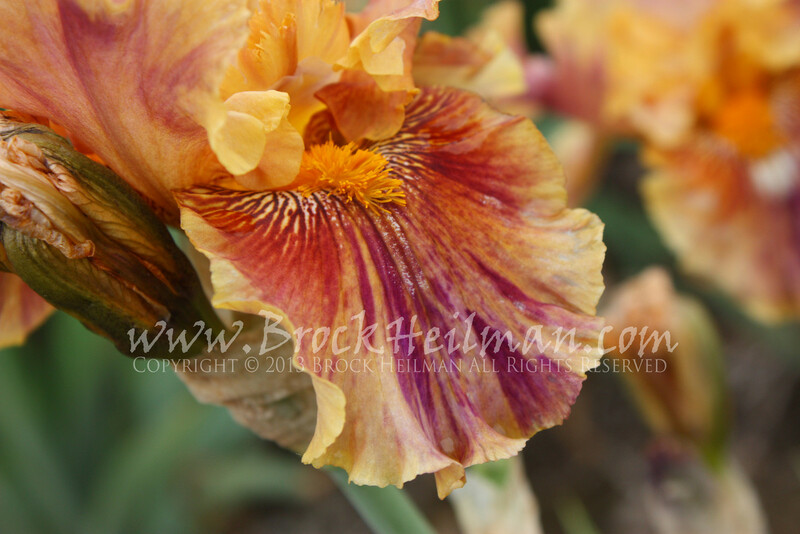 'Nora Eileen' was the first iris I grew with smooth, pleasing flowers in the magenta color class. Too few breeders have touched the surface in this vivid color class. They should as visitors spot this color from afar! 'Spring Social' was his favorite seedling from George Shoop's 'Spring Tidings'. It was a quality flower in shades of lavender, pink and rosy violet. Gerald's work with pale blue flowers and dark violet beards was a difficult class that earned his diligent devotion. 'Clyde' is a milky blue with very dark violet beards and a dark purple eye just below them. 'Emilo' was a milky blue with beards not quite so black. However, its perfectly formed rounded flowers on shorter stalks was the exceptional garden plant with wonderful, compact plants and strong stalks. 'Clouds of Glory' was a very pastel blue-white with fine deeper blue pastel petal edging. 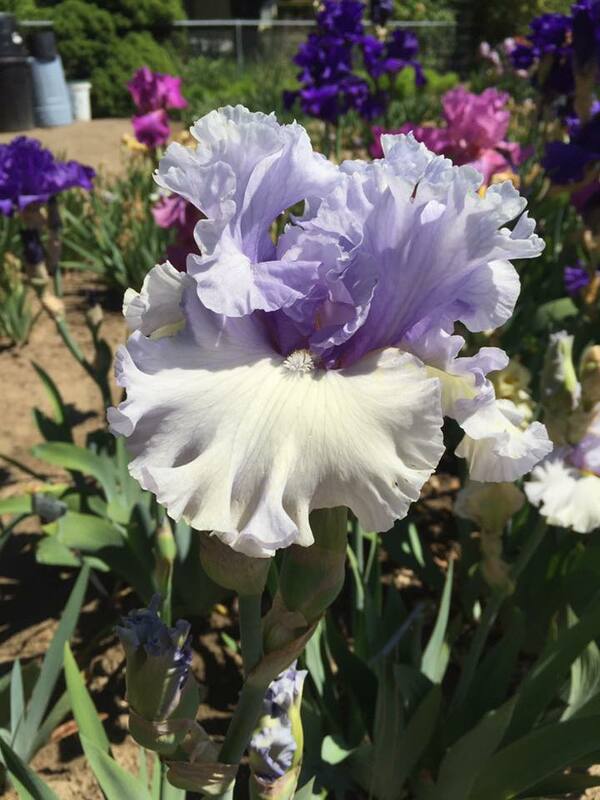 It is a difficult color pattern to work with but its impact on seasoned iris growers is to “ooh and ahh” at its simple elegance! I was taught early on that concentrating on limited colors and patterns was the key fame for an iris hybridizer. (Gerald NEVER made that declaration!) Blends were everywhere in his seedling rows! 'Carousel of Dreams' was his newest and brightest and a spectacular combination of lavender, red, soft gold and wire gold rims on petal edges. In addition, it is a great garden plant that offers heavy spring bloom with good increase and plant habits. 'Days Gone By' is a wonderful combination of lavender, violet and peach with striking red beards. It is a sister seedling to 'Spring Social' mentioned above. 'Golden Legacy' is a superlative creations with strong, tall, well branched stalks, 7 buds, and strong plants that produce large flowers in gold and amber tones with orange beards. It can hold its own among the best of the best! 'Grace Whittemore' is an early introduction from Gerald that is superior to many in the cream-yellow and white bi-tones. Its amazing super-wide flowers was far ahead of its time and went hardly noticed by the iris crowd. 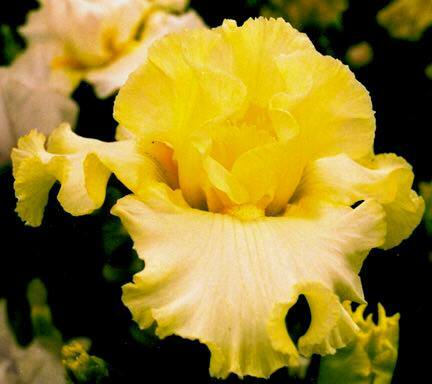 Also heavily ruffled, it has soft yellow standards, cream-white falls with precise, yellow borders and orange beards. I would brag on it during every garden visit. I was amused that he had the good sense not to waste time trying to improve it. 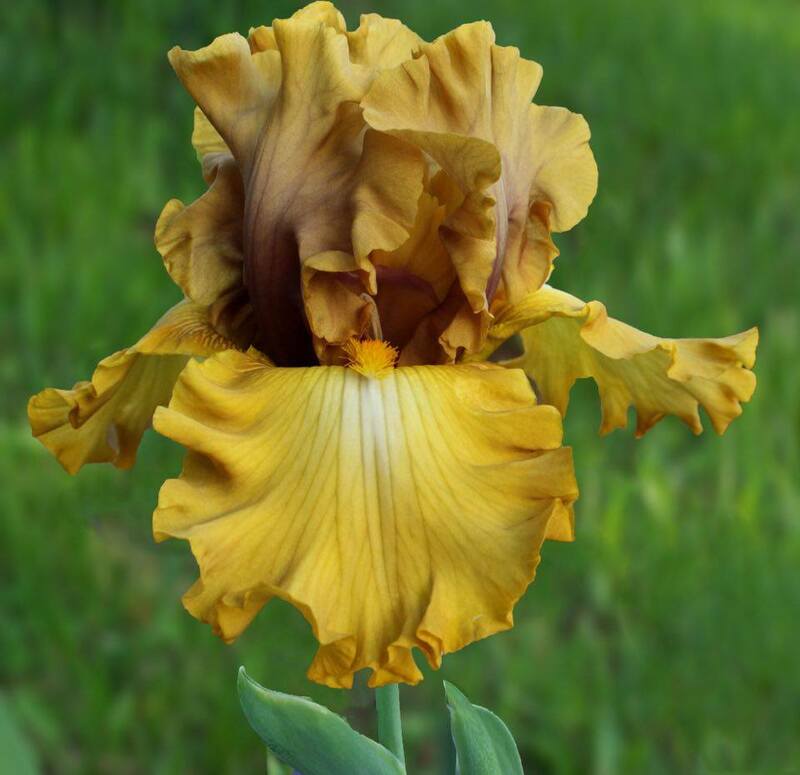 It remains a magnificent iris with a perfect score! There is also no category or rival to 'Ivory Ghost'. Huge, perfectly formed flowers on strong stalks are ivory-white, infused violet and deep yellow hafts with faint amber wire edges and orange beards. Vigor and form is no doubt from 'Fogbound'. 'Sunset Storm' is from variegated/broken color breeding but it is not revealed in this flower. It is an attractive blending of lavender and buff and was years in the making. (Check the lengthy parentage!) Sadly, its plant proved erratic in its behavior. Its magnificent blending of colors earns it a spot among my favorite Richardson introductions. Three others stand alone. 'Demonic' is a sibling to 'Blueberry Fudge'. It is deep, deep violet and has beautifully formed flowers with domed standards and excellent holding power in the garden. Its plants are wide bladed and can be left in 3-4 year clumps with excellent results. It is not quite black … and Gerald was working on the next step that never quite appeared--a sooty black iris with good form, strong foliage and good plant habits. 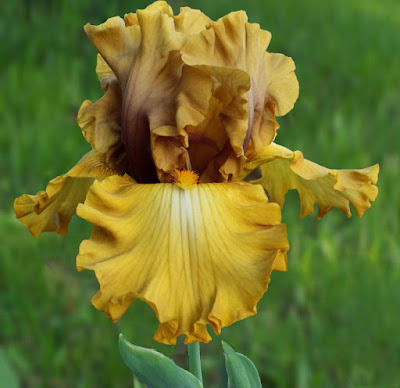 'Smoking Embers' is from 'Wild Jasmine' breeding and is a very dark rust iris from the brown side. The standards are slightly lighter and the falls have a pale with tiny “shadowed” rim. The hafts and beards are yellow and there is a white sunburst at end of beards. Compact plants and stalks that do NOT fall over. Last I will mention 'Temple of Lights', and iris I will likely grow forever. It is a very wide flower in cream with strong flushing of melted butter; intense amber-gold style arms. The cream falls have smooth gold hafts and tiny golden edging and orange beards. 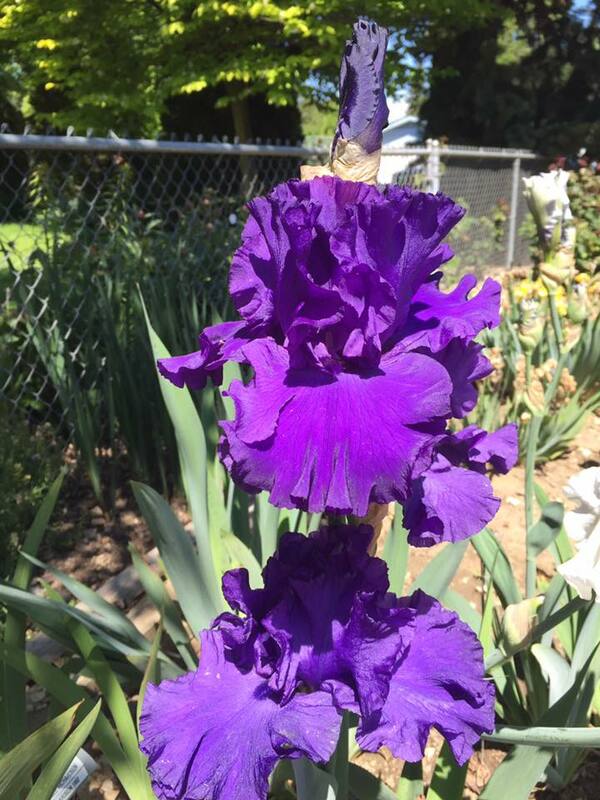 'Grace Whittemore' (see above) is the proud Mother of this beautiful iris. Expect a magnificent flower on a rugged plant. Thank you, Gerald, for choosing me as your friend. You have made my life and the lives of iris lovers around the world brighter and more interesting because of your tireless joy of spreading pollen in your wonderful garden. I miss you terribly and I will see you on the other side with dirty bare feet and your wonderful, welcoming smile! Thank you for your informative post on Gerard Richardson and his lovely iris. I have looked online but cannot find a source for his iris. I'm especially interested in Donaghcloney, Magheralin and Surfer's Dream. Do you know of any sources for Richardson iris? You might try this link: http://www.tbfinder.com/ and see if you have any luck locating the iris you desire.